"As a teenager, I used to find it rather curious that people regard their thoughts and emotions as integral to whom they are, but their perceptions as something totally beyond themselves. The world we perceive is, after all, part of our mental life just like our thoughts and emotions. 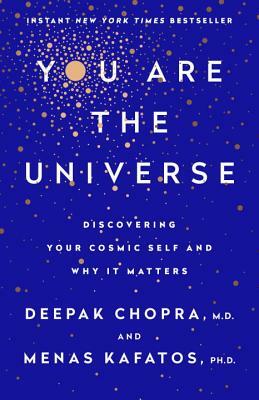 In this book, Deepak and Menas take this seemingly innocent idea to cosmic heights, revealing its true force and significance. They do it intelligently, in a scientifically well-informed manner, and with good taste. The result is delightful." —Bernardo Kastrup, Ph.D., author of Why Materialism Is Baloney, Brief Peeks Beyond and More Than Allegory. “You are the Universe could have been spelled Youniverse for not only are ‘you’ in the universe ‘you’ are at the start of it all. Chopra and Kafatos have put together a well-written and, as far as any scientist today knows, a completely accurate exploration of how the mystery of subjective consciousness provides the basis for material reality as it is presently understood. I highly recommend this for those who are curiously alive.” —Fred Alan Wolf, Ph.D. aka Dr. Quantum® Theoretical Physicist, author of The Spiritual Universe, National Book award-winning Taking the Quantum Leap, Time-loops and Space-twists, and many other books. “This book discusses an important aspect from neuroscientific point of view i.e mind creates the reality. The authors do not like to distinguish the external reality and internal reality. This is similar to Yigacara Buddhism. However, it raises a very important issue whether any physical theory should include boundary conditions too or boundary conditions are outside the physical theory. This book raises lot of such fascinating issues which may create an environment of new debate.” —Sisir Roy, T.V. Raman Pai Chair, National Institute of Advanced Studies, IISC Campus, Bangalore and (Former) Professor, Physics and Applied Mathematics Unit, Indian Statistical Institute, Kolkata, India.